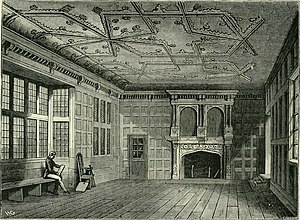 The Star Chamber (Latin: Camera stellata) was an English court which sat at the royal Palace of Westminster, from the late 15th century to the mid-17th century (c. 1641), and was composed of Privy Councillors and common-law judges, to supplement the judicial activities of the common-law and equity courts in civil and criminal matters. The Star Chamber was originally established to ensure the fair enforcement of laws against socially and politically prominent people so powerful that ordinary courts would probably hesitate to convict them of their crimes. However, it became synonymous with social and political oppression through the arbitrary use and abuse of the power it wielded. The first reference to the "star chamber"[b] is in 1398, as the Sterred chambre; the more common form of the name appears in 1422 as le Sterne-chamere. Both forms recur throughout the fifteenth century, with Sterred Chambre last attested as appearing in the Supremacy of the Crown Act 1534. The origin of the name has usually been explained as first recorded by John Stow, writing in his Survey of London (1598), who noted "this place is called the Star Chamber, at the first all the roofe thereof was decked with images of starres gilted". 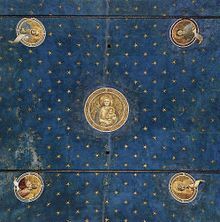 Gold stars on a blue background were a common medieval decoration for ceilings in richly decorated rooms, as still to be seen at Leasowe Castle, Wirral, the Scrovegni Chapel in Padua, and elsewhere. Alternatively, William Blackstone, a notable English jurist writing in 1769, speculated that the name may have derived from the legal word "starr" meaning the contract or obligation to a Jew (from the Hebrew שטר (shetar) meaning 'document'). This term was in use until 1290, when Edward I had all Jews expelled from England. Blackstone thought the "Starr Chamber" might originally have been used for the deposition and storage of such contracts. However, the Oxford English Dictionary gives this etymology "no claim to consideration". Other etymological speculations mentioned by Blackstone on the use of star include the derivation from Old English steoran (steer) meaning "to govern"; as a court used to punish cozenage (in Latin: crimen stellionatus); or that the chamber was full of windows. King Charles I used the Court of Star Chamber as Parliamentary substitute during the eleven years of Personal Rule, when he ruled without a Parliament. King Charles made extensive use of the Court of Star Chamber to prosecute dissenters, including the Puritans who fled to New England. This was also one of the causes of the English Civil War. In 1571 Elizabeth I had set up an equivalent Court in Ireland, the Court of Castle Chamber, to deal with cases of riot and offences against public order. Although it was initially popular with private litigants, under the Stuarts it developed the same reputation for harsh and arbitrary proceedings as its parent Court, and during the political confusion of the 1640s it simply disappeared. In the late 20th century, the expression was revived in reference to ways of resolving internal high-level questions within the government, usually relating to budget appropriations. The press and some civil servants under the premiership of Margaret Thatcher (1979–90) revived the term for private ministerial meetings at which disputes between the Treasury and high-spending departments were resolved. The term was again revived by the popular press to describe a panel set up by the Labour party's National Executive Committee to review expenses claims by Labour MPs in May 2009. In 2010, the press employed the term for a committee established by the Cameron ministry to plan spending cuts to reduce public debt. ^ "The Ceann Comhairle intervened and said the Dáil could not be used as a "star chamber" warning that people's reputations were involved and if the deputy had information he should go to the gardaí." ^ "Wallace claims NAMA official sought bribe". RTÉ News. 15 July 2015. ^ Lord Denning, Landmarks in the Law (1984), p 61–62. ^ a b "Star-chamber, starred chamber"; Oxford English Dictionary, second edition. Oxford University Press, 1989. ^ S.B. Chrimes, Henry VII, Berkeley: University of California Press, 1972: p. 99. ^ "Star Chamber". Tiscali.co.uk. Archived from the original on 2008-07-25. Retrieved 2012-03-05. ^ "Elliot Morley and David Chaytor first to face 'star chamber' as Brown moves to cull expenses cheats | Mail Online". Dailymail.co.uk. 2009-05-19. Retrieved 2012-03-05. ^ Smale, Will (2010-06-07). "What can the UK learn from Canada's budget cuts?". BBC News. Retrieved 2012-03-05.